In 2009, as part of the celebrations for the 50th anniversary of the passing of Jamyang Khyentse Chökyi Lodrö, some of Sogyal Rinpoche’s long-time students offered this beautiful short film on “the master of masters”. Volker Dencks, Barbara Lepani, and Stéphane Lun-Sin, gathering years of research on the life of Jamyang Khyentse Chökyi Lodrö, including journeys to the varied corners of the world to collect testimonies from the masters who knew him, assembled this labour of love and devotion. For the past years, a group of Rigpa students has been researching the life of Jamyang Khyentse Chökyi Lodrö. We have delved into the archives to bring together Sogyal Rinpoche’s many intimate recollections of his childhood with Jamyang Khyentse, who raised him like a son. We have scoured the written accounts of other masters and scholars for details of Jamyang Khyentse’s life, and our own interviews with his surviving disciples have taken us to Tibet, India, Sikkim, Nepal, the USA, the UK, France and Spain. Most recently, we have begun to make contact with some of the Chinese Buddhist students who travelled to Tibet to study with Tibetan masters during the time of Jamyang Khyentse. So far, we have interviewed about fifty of his disciples, and others who knew him well. Our research, which we aim to share more fully in the future, has borne out, again and again, how this ‘master of masters’ was regarded with the very deepest respect and devotion by followers of all of the Buddhist traditions of Tibet. 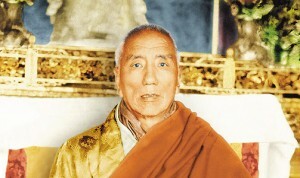 Jamyang Khyentse Chökyi Lodrö was a legend in Tibet and the Himalayas, but has been less well-known in the western world. Yet what becomes steadily clearer from our research is the huge influence he had on the spread of Tibetan Buddhism not only in the East, but also in the West. We hope in some small way to bring the attention of a wider audience to this extraordinary master, who must rank as one of the greatest saints of the twentieth century in any of the spiritual traditions of the world. You can read the complete View: The Rigpa Journal article online here. For more information about this project Remembering the Masters, please see their blog here, which contains some wonderful posts of many stories about the life and times of Jamyang Khyentse Chökyi Lodrö. This The Tibetan Blog of Living and Dying post is part of a series, also called Remembering the Masters, featuring short teachings and stories about Sogyal Rinpoche’s masters. Further videos in this series will be presented over the coming weeks. You can find older posts on our videos page.